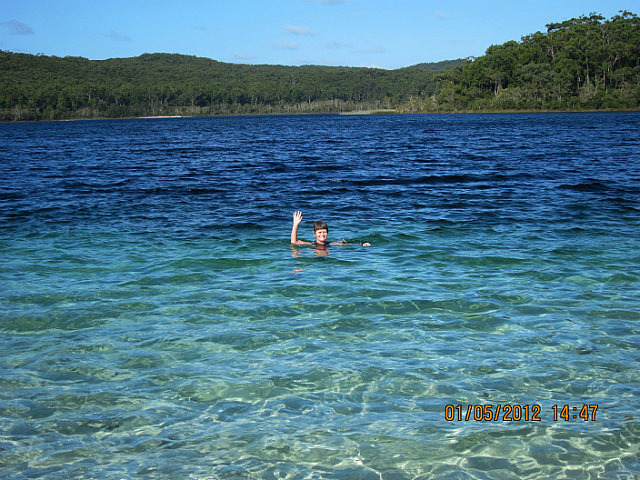 The Coughlan Family recently visited Fraser Island and blogged about their experiences on the World Heritage-listed island. Here, we share their story with you. June 2012. We arrived in Hervey Bay, the gateway for Fraser Island and a great campsite with pool and jacuzzi, the next day we began our trip by ferry over to the largest sand island in the world, 123km long. Shane our guide drove us around this wonderful island in a four wheel drive bus for the next two days pointing out interesting sites and giving us lots of information about the area and about the aboriginal peoples who once lived there and their ways. He had a great sense of humour and kept us entertained all day long. Our first view of this wonderful place was a drive down 75 mile beach to Lake Wabby where we hiked in 2.5km to Hammerstone sand blow and then on to swim in the lake with the catfish. It was a great walk and a lovely swim and on our return journey out we were lucky to spy a large lizard basking in the sun. 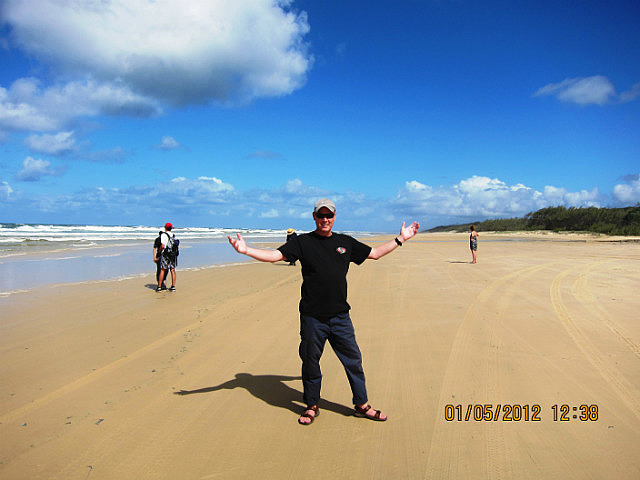 75 mile beach is wonderful but guess what, no swimming – its full of sharks and stingers and to prove the point there were hundreds of blue bottles (jellyfish) on the beach which when you walked on them went pop, pop, pop, like rice crispies but without the snap and crackle! 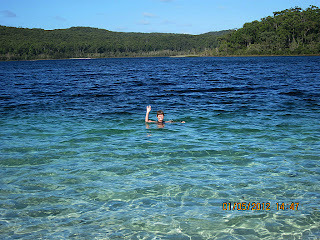 Next stop was a swim in Lake McKenzie which is a Perched Lake i.e. it has an impervious seal so it is perched 90m above sea level and is dependent on rainfall,it has such crystal clear water, is surrounded by sandy beaches and eucalyptus forests, a little piece of heaven, it was wonderful. To top off the day we walked the Wanggoolba Creek along an amazing clear, silent river flowing on sand through a tropical rainforest with all the giant king ferns, satinay trees and kauri pines, did I mention heaven already? We were staying in luxury and having amazing food in the Eurong Beach Resort on the island and in true backpacker style we ate rings around ourselves. The next morning we headed back up 75 mile beach (it is a registered highway) and we took an amazing flight (it is also a landing strip) up and over the beach to have a look for marine life in the sea and then fly over Lake Wabby, Lake McKenzie and get a good view over the island from above, what a treat. We had a quick look at the Maheno shipwreck, washed up on the shore in 1935 and rusting away gracefully ever since. Then it was off to Indian Head to have a look over the island and to try spotting sharks in the waters below, there was too much rough water to spot much in the ocean but the views from the top were spectacular. After Indian Head we continued to Champagne Pools with time for a quick dip in the rock pools with bubbles caused by the waves crashing over the rocks. On our drive back along the beach we were rewarded with the sight of some dingoes and a great chance to have a look at these lovely wild animals. The Pinnacles, our next stop gave us a chance to see some of the 72 different coloured sands on Fraser Island and then it was off to Eli Creek where 4.2 million litres of fresh drinking water flows every hour out of the lagoon on to the beach. Alan and I walked up the creek and then floated down to the ocean on our backs, hearing nothing and watching the flora and fauna float past as we wound our way downstream drinking the crystal clear water and maybe humming a tune to ourselves..... heaven is a place on earth. The next morning we left Hervey Bay again heading north, stopping off in the small town of Childers where we wandered around this town that has kept its 19th century roots alive, never mind the buildings and the old pharmacy but everyone says hello.......so Goodbye for now.